Until very recently I’d never had to configure PPPoE. Most of my clients in that sort of connection speed range have ADSL with a router provided by their ISP. A Router that connects via PPPoA usually. Here in the UK the main ISP’s (BT and Virgin) are busy rolling out FTTC connections that terminate with a ‘modem’ that presents an RJ45 socket. So without the need for a router, you can get the ASA to perform the authentication (supply the username and password via PPPoE) and either use a static IP address, or obtain its IP via DHCP. IP Details (If you have bought static IP’s you will need the range of IP addresses and the IP address to use as the firewalls default route (default gateway). Some ISP’s will expect you to configure DHCP and will make sure you always get the same IP. Authentication method: CHAP, MSCHAP, or PAP (If your ISP acts confused when you ask, it’s probably CHAP). 2. 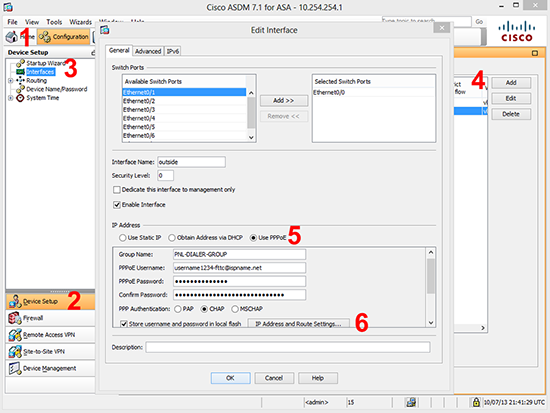 Connect to the ASA > Go to enable mode > Go to configuration mode > Create a ‘vpdn’ group, (here I’ve called it PNL-DIALER-GROUP) > Set the authentication method, (here I’m using CHAP). 3. Supply your username and password. (The store-local command puts the details in a protected area of flash memory). Command for an ASA 5505 (By Default VLAN 2 will be the outside VLAN). Command for an ASA 5510 (or greater) (By Default Ethernet0/0 will be the outside interface). You can use the following command/syntax to troubleshoot. 1. 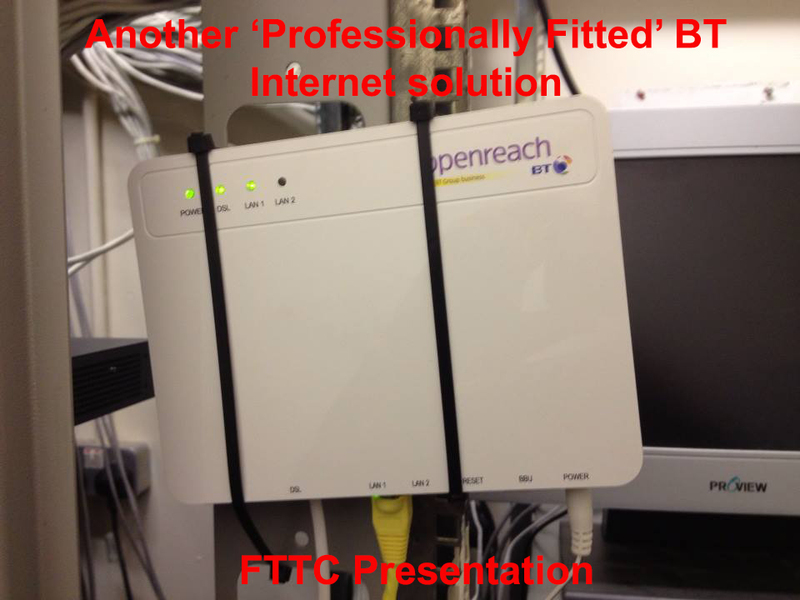 Connect to the ASDM > Configuration > Device Setup > Interfaces > Ethernet0/0 > Edit > General Tab > Use PPPoE. Enter VPDN Group name username and password. 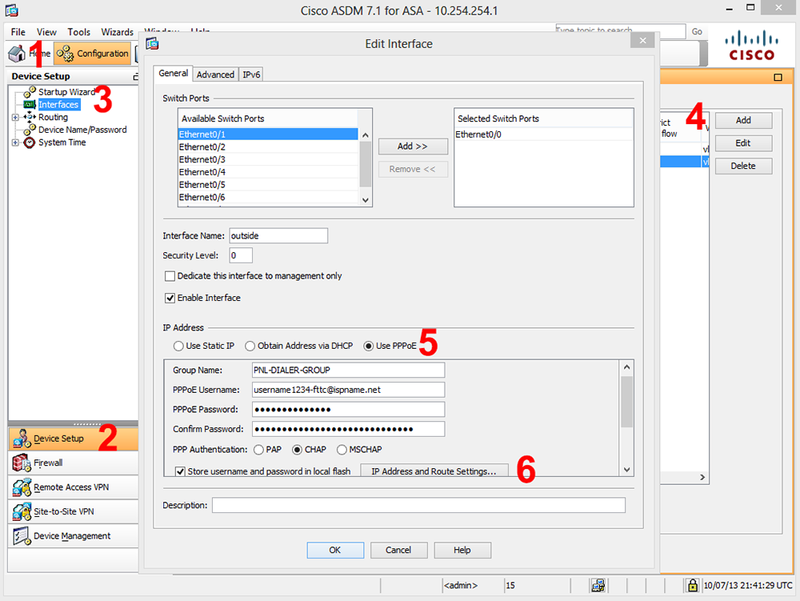 Set the PPP Authentication method PAP / CHAP or MSCHAP. File > Save Running Configuration to flash.